Walter Korsing (1905 – 1933) was known in the city for his anti-fascist stance. The native Frankfurter's sympathies for socialist ideas had more of an emotional background than a theoretical basis. On 19 June 1933 Frankfurt paramilitary Nazi SA members cornered him. They tried to violently extract from him names of Social Democratic and Communist Party members. Walter Korsing refused to give any names. On the avenue to Lebus, his murderers shot twice at the unarmed man. After the murder they claimed to have acted in self-defence. 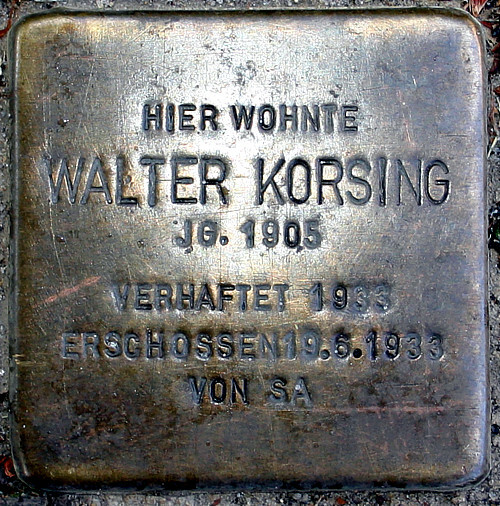 Walter Korsing was the Nazis' first political murder victim in Frankfurt (Oder) after they were handed power.